In my recent visit to India I got to know about FOODPANDA. (www.foodpanda.in) - the online delivery site for delicious, tasty, mouth watering dishes. A wide range of succulent, hot meals can be delivered at your door step within a few minutes. Delivery from Foodpanda is hassle free and with a few clicks of the mouse your favourite food can be at your door step. I used this service several times and got an opportunity to enjoy great dishes from all over the city. The food is served in a hygenic way and the pleasant behavior of the delivery boys adds a extra flavour to the dish. You can also enjoy great savers from their website. I would recommend Foodpanda to ONE AND ALL. Now coming to today's recipe . This recipe originated from the royal kitchen of the Nizams. It is a dish that doesn’t call for an elaborate process but requires a lot of ‘tender loving care’. 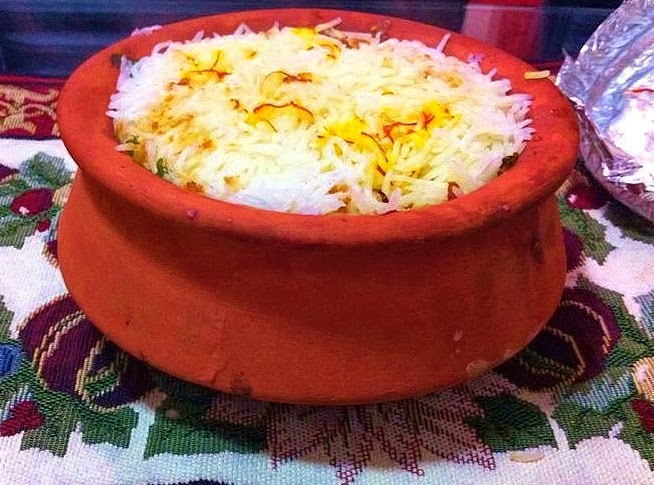 Kachha (raw) biryani is in Hyderabadi style, where marinated raw chicken and partially cooked basmati rice are layered and cooked on dum, over low heat. I have prepared this biryani several times, and the recipe is perfect and has never failed me. 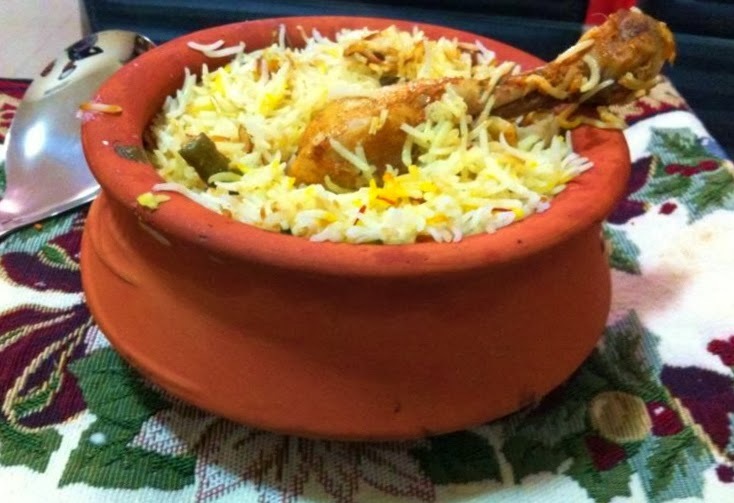 Once the biryani is cooked on dum, as you open the lid, the kitchen smells fragrant, rich with the reassuring aroma of pure ghee, saffron and the chicken cooked to melt in the mouth with tenderness. Wash the chicken and leave it in a strainer atleast for an hour so that you don't have any water in it. Add all the ingredients one by one into the chicken. Leave it to marinate atleast for an hour or you can even marinate a day earlier and leave it in the refrigerator overnight. Soak rice in lukewarm water for a minimum of 30minutes. (this will make your rice grain longer). Simultaneously in a big wide vessel,boil lots of water with salt,caraway seeds,cinnamon,cardamon,cloves and bay leaves. When the water starts boiling add the soaked rice to it. Give it a stir,dont keep stirring everytime as this will break your rice grain. Cook till the rice grain can be broken into 2 when held between two fingers. This will take 2-3 minutes as you have already soaked the rice for 30minutes. Keep checking now and then. Drain the rice in a strainer and keep the rice aside. Take a wide vessel in which you wish to dum the biryani in or you can alternatively use a clay pot. Put a very thin layer of rice as your first layer This is a protective layer so that you don't burn your chicken in case you over cook. Put the marinated chicken as your second layer. Put half of the cooked rice as your third layer. Sprinkle evenly fried onions,coriander leaves,mint leaves and lemon juice as your fourth layer. (fried onions should be put in this layer and not the final layer as they go darker if put in the last layer because of the steam). Put the remaining half rice in the fifth layer. Finally sprinkle the saffron mixed in milk evenly. Desi ghee mixed with oil should be put in from the corners to make full circle. Seal this with aluminium foil. Cook on high flame for 8-10 minutes till you see some steam escaping. Now lower the flame for 15minutes. Keep rotating your vessel clockwise every 3 minutes. Switch off the stove and leave aside for 10minutes. Don't mix in the whole biryani when you serve. Take them out in layers like the chefs does. You can freeze the onions in the freezer in a zip lock bag after you fry them to make it crispy. Thanks for the new posting. I am a hyderabadi and looking for chicken khorma recipe. Would you please post this at the earliest. I was inspired by this recipe and tried it using paneer instead of chicken. Great hit for Thanksgiving dinner. I used a pressure cooker to do the dum covered it with aluminum foil. I would have preferred it became a bit more moist. tried it with paneer instead of chicken. I am eager to learn marinated raw chicken and partially cooked basmati rice. I have heard about hyderabadi biryani and curious to cook it. I am fortunate to get indian food recipe ideas from your blog. We tried it this Friday evening. We cooked it on charcoals. Dum got extended by 5 minutes but biryani turned out to be real real good. Because of excess dum masala got dried and everyone was asking for masala. I will take care of it next time Insha'ALLAH. Question for you though is why we dont add tomato in this recpie. Because my Nani and Wifey were asking for it and I refused to add it. Good to hear that Biryani turned out good. My experience tells me that only with continuous tries you will get the perfect biryani. Coming to your question, hyderabadi biryani is a pure mixture of spices and meat and so tomoto is excluded. Yes, if you are trying Bombay biryani then you can add tomatoes as its one of the ingredient for that recipe. Depends on what you are trying and what traditional recipe requires. I think the reason why masala dries up in biryani is due to Improper proportion of curd or oil or rice or a combination of each of them. My personal experience is to keep trying with different combinations/methods till u reach perfection. 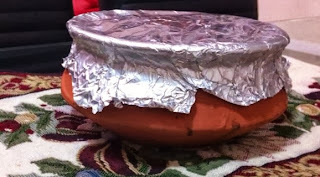 Hello mam actully i have want to ask about the cooking time that 25 to 30 mins are enough for cooking if using a metal Vessel and one more thing that insted of direct heat can we use a flat tawa as a base for vessel. The use of flat base or tawa is used to avoid the bottom getting burnt. Yes, you can use a base if you frequently experience the bottom getting burnt. Can anyone let me know how many KG's is 5 cups rice (to be used in biryani)..
Left hyderabad for US. Did not step into the kitchen back home. Tried to cook biryani by following this recipe. Turned out to be awesome. Hi! don't you need to add star anise, cinnamon and javantri? The reason i'm asking is because every recipe i've seen so far includes those. does the authentic version not carry it? Haven't tried Hyderabadi chicken biryani. I am for sure gonna make this recipe. Great Blog. I have a huge list to cook up from your blog. Could you please tell me, how much salt do you use while marinating the chicken? And is 9 tsp salt correct for the rice? If I want to increase the proportion of rice, (1 KG Rice, 1 KG Chicken), what part of ingredients should I can increase in proportion to the rice? If I keep Step 1 ingredients same and increase the proportion of Step 2 and Step 3 ingredients, will that be okay? This recipe is for 1 kilo chicken and say 3/4 kilo rice isn't it? I want to make for 1 kilo rice and 1 kilo chicken. I m guessing increasing the step 2 and 3 ingredients should be correct. Step 1 quantity maybe should remain same.